A collection of answers people donâ€™t want to hear to questions they didnâ€™t ask. 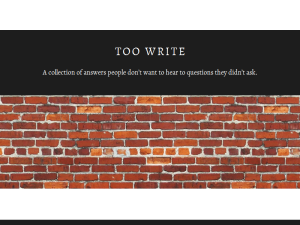 This what your Too Write Blog Ad will look like to visitors! Of course you will want to use keywords and ad targeting to get the most out of your ad campaign! So purchase an ad space today before there all gone! What it's like to have finally kick started a career and what my thoughts of the future are. So here I am… A fully fledged adult. I pay taxes now, I commute, I go home and ‘put my feet up’. I even make that ‘ahhh’ sound when I take my trousers off after I get in. The same sound that you hear when a fifty-odd plumber has his first sip of Carling after a long day of fixing people’s U-Bends. That’s what every adult is meant to do right? I’m not disillusioned by the working world at all and I am exactly where I want to be right now. I’m finally earning money and I can afford to start saving (hold the applause). The only problem that comes with the luxury of that yearly salary is that after a few months of the nine to five routine, I keep asking myself a recurring question… what comes next? After nursery you go to primary school, after primary school you go to secondary school, after secondary school you do a-levels, you do a-levels to get in to university, you get your degree in order to get a job, you get a job and then… and then what? This is the end of the line people! Generations of young adults being baby-fed information up until the age of twenty one with the insurance that no matter what, they know the title of the next chapter of their life, and here I am turning the page to find it blank. I am looking in to the abyss. For the first time in my life there is no end in sight. No three months summer holiday that provides an intermission between one episode and the next. No more bunking off class and doing what I want with my afternoons. No more waking up at 1pm (3pm). The finish line has disappeared and I have no choice but to carry on running. Make no mistake; It’s a great feeling to finally have started a career. I’m constantly meeting wonderful people who will definitely help me along the way. This is a part of adulthood and we all have to come to terms with it at some point. I also love that fact that my life finally has some direction. Which direction you ask? God knows. Maybe (definitely) it takes some to get used to. If only there was something that could soften this treacherous blow… Did someone say ‘pay rise’? What now? Life after University and the struggles of adulthood. University is finally over and I come to terms with what it means to be an adult. Stop all the clocks! Uni is over guys. Well, for me it is anyway, and I’m gutted. No longer will I feel that sweet student sensation of mind-numbing fatigue after hitting the books in the library all night. No more will I ever step foot in a pub whilst wearing PJ’s, deflecting the glances of judgement from the locals with that continually resonating thought of ‘hey ho, I’m a student! Who cares? Not me!’ To all of you 2016 graduates who are facing this with me, welcome to the real world, to the working week and the Sunday rest… now someone hold my hand as I sob into my Fresher’s T-Shirt. It’s now got to that point where I have started to deliberate whether or not I should have stayed on. Not because I fancy doing the masters for the ‘worthier’ degree or all of that extra work, including another dissertation (as if the first one still isn’t haunting my dreams). I just sometimes think why did I cut short the best period of my life when I didn’t have to? I could have prolonged my entry into the adult world by an entire year, all the time whilst living with a few good mates who were still staying in my university town. I could then have entered adulthood with the knowledge that I wrung out that university towel of experience until it was bone dry. But I didn’t… and now I’m here… doing admin at a college… only until I can find myself a job in my preferred industry that is. Although, the admin job could not have come at a better time during this interlude in my life where I’m stuck between being a student and a fully fledged adult. As mind numbing and tedious as it has been alphabetising files and making sure a box is ticked on about a thousand student’s profiles, at least I have something getting me out of bed in the morning. For just over two months I had been waking up later than I’d like to admit and binge watching Can’t Pay We’ll Take It Away like there was no tomorrow! It was relief to finally be able to have a purpose to get up, and finally get my bank account back in to positive numbers again is a bonus too. It’s been a great experience and the people here have been great, no matter how many times the system crashed and everyone was running around frantically trying to fix it. After being here for almost seven weeks though, it is almost definitely time move on and land myself a job in the creative industry (because who wants to be a pencil pusher? Right?). I’ve always known I would like to write for a living and so hopefully I’ll be able to move one step closer to joining the real world and finally becoming a functioning member of society in a job that I’ve worked so hard to get. I’ve spent the last fifteen year in education, so surely it’s time, right? If you are the owner of Too Write, or someone who enjoys this blog why not upgrade it to a Featured Listing or Permanent Listing?